Who is Pedro Gonzalez Arbona? Pedro González Arbona is an up and coming young Spanish artist. His debut album, Introducing Pedro González Arbona, is a brilliant blend of soothing melodies and dramatic solo piano compositions—and showcases a talent well beyond his years. His music was influenced by European and American cinema at a very young age creating his desire to compose movie scores. 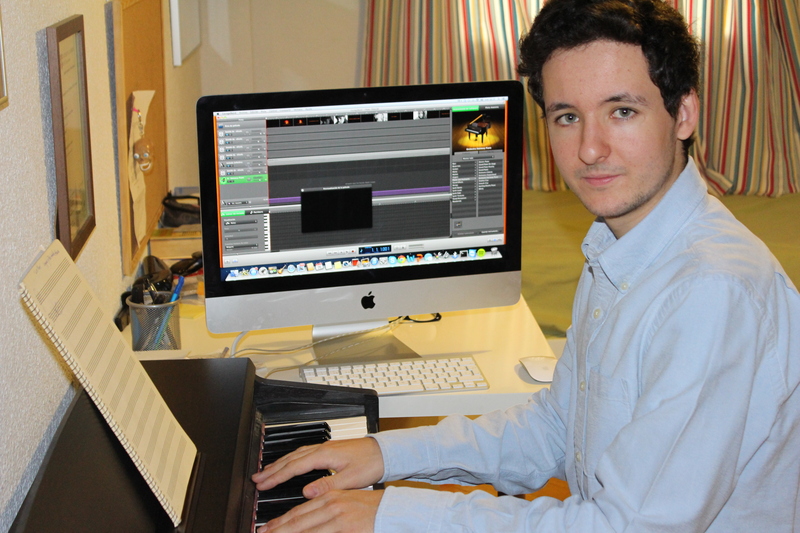 Pedro composing at his studio in Madrid, July 2013. Pedro participated in the Education First (EF) study program in the summer of 2010 that brought him to Seattle, Washington. With his engaging personality and eagerness to immerse himself in American culture and history, Pedro quickly became like family in the Nelson household and played the piano daily while he stayed in Seattle. Since Pedro loves cinema, he would play songs from American films like The Sound of Music and The Sting. Interspersed with these highly recognizable movie tunes, Pedro would also perform some of his own compositions. But he never let on that he composed them. “Portman” immediately became his American mother’s favorite song, although she really did not know who the composer was. A few months later after returning to Spain, Pedro wrote “Seattle“, sent it to the Nelson’s, and dedicated it to them. This was the first time they knew Pedro composed music. Over the next few months, Pedro composed more songs and sent them to his American family. In June of 2011, when the Nelson’s offered him the chance to record an album, he divulged his secret. “Portman” was really his original composition. 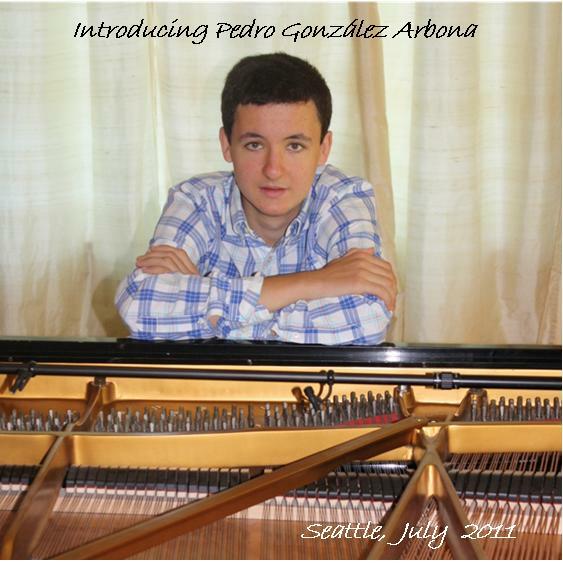 Pedro returned to Seattle in the summer of 2011 and recorded his debut album, Introducing Pedro Gonzalez Arbona. By December of that year, Pedro’s music was available worldwide on itunes, Amazon.com, Zune, Spotify and other online music services. His American mother, Ardis Nelson, sponsors Pedro’s pursuit of his musical gift and manages his music from Seattle. But the story doesn’t stop there. While Pedro was busy composing music and attending his first year of university studies, Ardis was busy writing about the connections between these families. Over the previous year, the families both lost their grandmother’s in painful passings. Ardis submitted her manuscript, “Walking My Mother Home” to Cladach Publishing. The story was published in Journeys to Mother Love in August 2012. Pedro composed several songs to accompany the story. Pedro’s music has gone on to capture the attention of Spanish and American film producers. To date, he has composed soundtracks to two Spanish short films, Thirst for Love and Always Together, with more in the works. 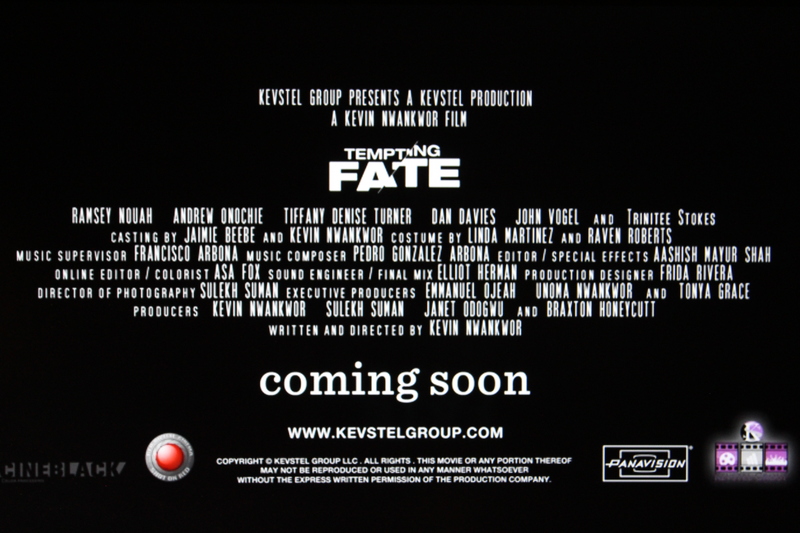 The soundtrack to his first American full-feature film, Tempting Fate, was released in February 2015. Pedro and Ardis attended the VIP screening of the movie in Houston in July 2014. The movie will be released throughout Nigeria and Ghana in July 2015. For the latest information about Pedro’s musical pursuits, visit pgarbona.com. You can support his music career by liking his Facebook page, Pedro Gonzalez Arbona, Composer. Samples of his music can be heard by clicking on the music player on the right sidebar of this page. More of Pedro’s music is showcased on the video page of this site. To purchase Pedro’s debut CD, “Introducing Pedro Gonzalez Arbona”, along with an autographed copy of “Journeys to Mother Love”, for a discounted price of $22.99 (normally $25.99) select the button below. Pedro’s second CD, Memories, was released in January 2015 and is available on iTunes, Amazon, Spotify, CD Baby, and other online music sites.